Bishop Kevin C. Rhoades welcomes Lutheran Church-Missouri Synod congregations to stand together for religious liberty. Gathering April 17 at St. Paul Lutheran Church, just a few blocks from the Cathedral of the Immaculate Conception in downtown Fort Wayne, Lutheran Church-Missouri Synod held a procession to the cathedral. 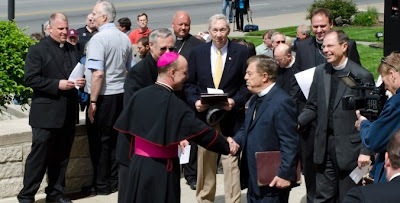 There they gathered in prayer and song with Catholics and Bishop Kevin C. Rhoades on the plaza in front of the cathedral and presented letters of support and encouragement “as we stand together with (the bishop) on this issue of religious liberty,” noted Dr. Charles Gieschen, academic dean of Concordia Theological Seminary in Fort Wayne, one of two Lutheran Church-Missouri Synod seminaries in the U.S. The history and heart of America is that citizens are free to follow their consciences in matters of faith. “We urge our leaders to honor and respect this liberty, so that together we may be a nation that is under God and a shining light on the hill,” Rev. May said. “In the end we are conscience-bound to obey God rather than man,” Rev. May said. 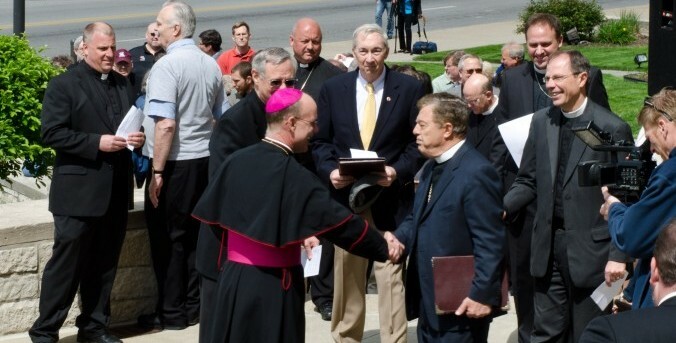 “Even as the Lutheran faculty and students of Concordia Theological Seminary have peacefully stood and walked with Roman Catholics in this community for many years in upholding the sanctity of human life, we again stand with you on the issue of protecting the free exercise of religion in our great nation so that Christians may be about the mission that Christ has given to His Church,” Gieschen said. The Lutheran Church-Missouri Synod presented 112 letters with 1,396 signatures from members of churches and church institutions. Bishop Rhoades has championed religious freedom rights since the Obama administration announced the Health and Human Services’ mandate requiring Catholic institutions to cover contraceptive drugs, sterilization and abortifacient drugs in its insurance plans for its employees. “In effect, the government is dismissing our liberty when we are engaged beyond the sanctuaries of our churches and doing the good works our faith calls us to do, contributing to the common good,” Bishop Rhoades said. “Religious liberty is more than freedom of worship — it includes the freedom to practice our faith in society without coercion from the government to violate our consciences,” he said. “Religious liberty is a God-given right, a gift granted to us by God,” he added. “We stand together as Lutherans and Catholics today in opposing the attack on our religious liberty by the federal government,” Bishop Rhoades said.